The Atlantic Coast Conference has released its end-of-season awards today, with Virginia Tech nabbing 4 of the 10 total awards. No major surprises at the top. Notre Dame’s Emma Reaney and Florida State’s Pavel Sankovich were named Female and Male Swimmers of the Year after outstanding post-season performances. Reaney dominated the breaststrokes at the ACC in her first season in the conference, smashing the American record in the 200 breast on the way. 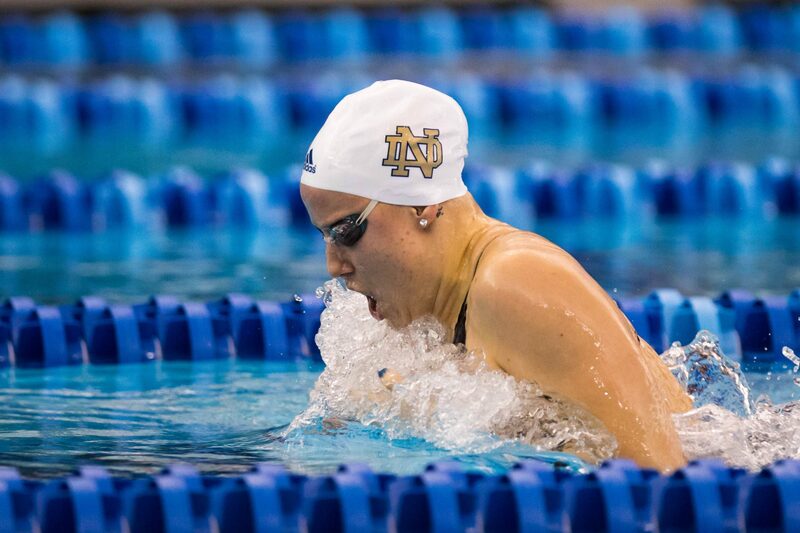 She then lowered that mark even further at nationals, winning an NCAA title in the event, Notre Dame’s first. Sankovich was an all-purpose weapon for the Seminoles at the ACC Championships, winning three individual titles (200 IM, 100 fly, 100 back) plus a relay (the 400 medley). At NCAAs, Sankovich earned All-America status and finished in the top 8 in a pair of events within the same session, the 100 fly and 100 back. Duke’s Nick McCrory won his fourth consecutive ACC Diver of the Year award, completing the sweep for his collegiate career. McCrory won the Platform diving event at NCAAs, his fourth NCAA championship in that event for the Blue Devils. Virginia Tech’s Kaylea Arnett took home the female Diver of the Year title. Arnett won ACC titles on 1-meter and 3-meter, and took third overall at NCAAs on 1-meter. Virginia Tech also got a Male Freshman of the Year award for Jan Switkowski. Switkowski was the runaway ACC Champ in the 500 free and competed at NCAAs. Female Freshman of the Year went to Virginia’s Leah Smith, the ACC champ in the 500 and 1650 frees, plus an All-American at NCAAs in the mile. Coaching awards went to Virginia Tech’s Ned Skinner, whose Hokie men won their first ACC Championship this season, and Augie Busch, who led Virginia to its 7th straight ACC women’s title in his first year as head of the program. Virginia Tech’s Ron Piemonte was named Women’s Diving Coach of the Year, while Duke’s Nunzio Esposto won the corresponding men’s award. My vote for swim coach of the year would have gone to N.C. State’s Braden Holloway. His swimmers scored considerably more points than Skinner’s and the team only got 2nd because their divers lost to VA. Tech by somewhere north of 150 points.